A crocodile was spotted by a farm worker on Friday evening at a farm in Kurni village on Yamkanmardi-Hukkeri road. People had gathered at the spot when a member of the “Explore the Outdoor”, Gokak contacted group leader Ayub khan in Belgaum, who rushed to the spot and rescued the over 9 feet crocodile. 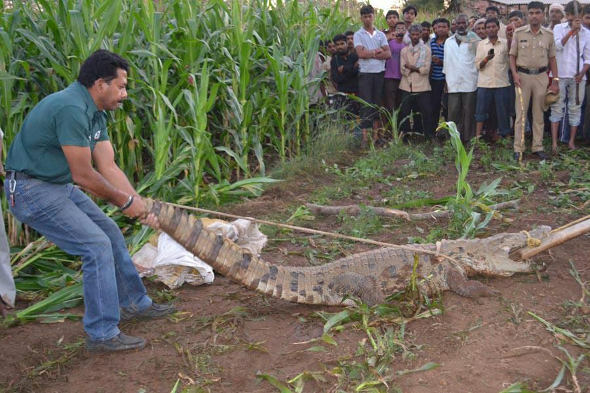 The members of the rescue team include Musa Sarkawaz, Mazid Shaikh and Prashant Dongare.He said that the crocodile, a female weighing around 200 kg, was handed over to the mini-zoo at Bhutaramanahatti on Belgaum-Yamkanmardi road. He said that the predator must have come out of its habitat, a rivulet or the Hidkal dam, in search of food and took shelter on the farm. 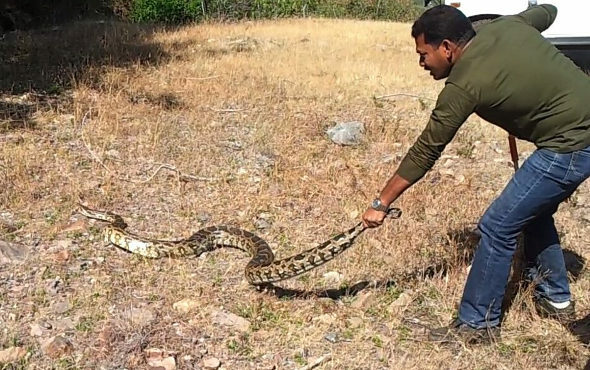 Also, on Saturday, Mr. Khan and his team rescued a 13-feet-long python from a spot near Riddhi Siddhi Gluco plant on Gokak-Falls road and released it into the thick of the forest, 13 km away from Gokak town. I want all animal lovers to come together to help the animals and save their lifes….they need us..they want protection…. Hey I have cute kitten wich came to me few days ago I wanted keep it but near ma home there few big cats attacking ma kitten so I dnt want it to die and I dnt want keep it tied for a day till I rittern home plz give me a suggestion or any animal rescue NGO’s in belgaum that I can hand over it to safe hands plz help me thank u….